Moscow is a great city. It’s always awake.The mathematics is advanced, and it’s well taught. The small size of the program provided the opportunity to really get to know students and professors. Moscow is fantastic and this was the ideal program to learn and practice Russian while also studying advanced math. Math in Moscow is such an amazing program. If you love math and want to experience a new culture at the same time, this is probably the best choice. The professors are all passionate and they truly care about the students since classes are small. The two trips to St.Petersburg and Suzdal are enjoyable too. Being in a different country is not a surprise for me but being in Moscow is definitely filled with surprises. For me personally it’s a remarkable experience I will never forget. It’s a great challenge, both hard and fun. But if you like mathematics, you shouldn’t miss this program. You will meet a lot of people who have the same interest as you. 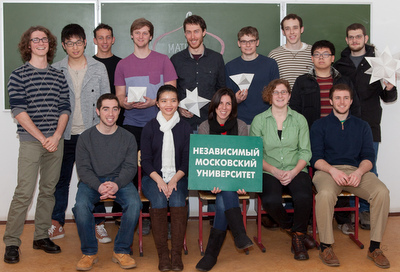 Math in Moscow was an amazing experience, I would highly suggest the program if you love math. If you’re looking for a challenge, this is the place for you. The professors do a great job of adapting the courses to a level that ensures that you reach your potential. This may have been the most influential event in my math education, as well as my education as a human being. To say this program is difficult is an understatement. Not only does it challenge you mathematically but trying to navigate and adjust to Moscow life was also very difficult. However, I find the mathematical culture and traditions here very inspiring. Everyone, from grade school children to university student to tenured professors are incredibly proud of and dedicated to their mathematical pursuits. I definitely would recommend this program to any young and aspiring mathematician. It will change your perspective. Participating in this program was quite an adventure. The classes here are unique to each professor, but I found that all of my professors were open to being challenged by us. I definitely recommend taking advantage of that. Learning Russian while living in Moscow was also a great experience – it was a treat and a challenged to experiment with practicing what I had learned, and it was humbling. Moscow is wonderfully foreign, and Math in Moscow is a great way to explore it while still living with Americans and having a lot of help getting around.